Mary Jane Barclay Ford, lived a good life in Bristol, Connecticut. She married Jerome B. Ford and settle there. She was an heir to Alexander’s estate and fortunately she stayed in Connecticut. By staying in Connecticut Mary has made it easier to find her. Jerome B. Ford, born 28 October 1845 in Unionville, Hartford Co., Connecticut was the son of Omri/Onri Ford and Catherine Kent. He married Mary Jane Barclay on 17 June 1866 in Unionville, Hartford, Connecticut. I tried to get a copy from the City of Farmington but they do not have this marriage. I do find a source at the Family History Library and I will have to follow-up. 1. Rosalie Ford was born about 1867 and died in 28 February 1886 in Bristol. Place of birth Collinville, Conn. 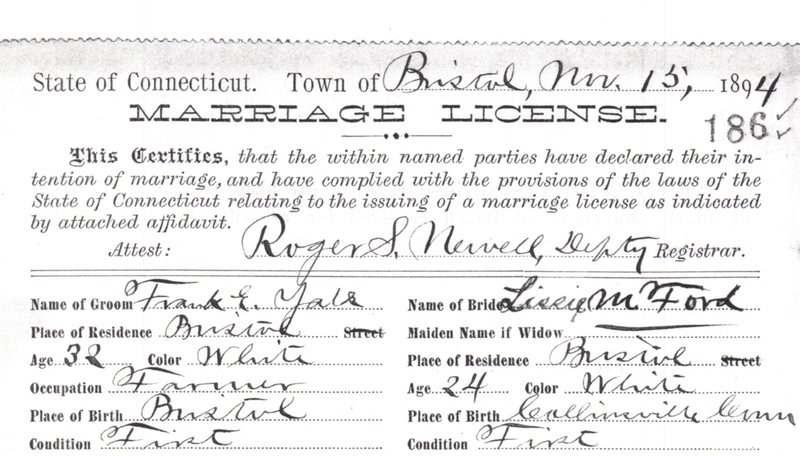 Source: Marriage License, State of Connecticut, Bristol, Nov. 15, 1894 #186, Frank E. Yale to Lissie M. Ford. Alfred Jerome Yale who was born 25 October, 1895 in Connecticut and died 26 Dec. 1965 in San Diego, California. He is buried at Fort Rosecrans, Pt. Loma, San Diego, California. I have that he married Hannah Bertha Kessler born 20 June 1883 in Rochester, Lorain, Ohio but according to the obituary at his gravesite on Find A Grave he was married to an Eleanor and had a daughter. 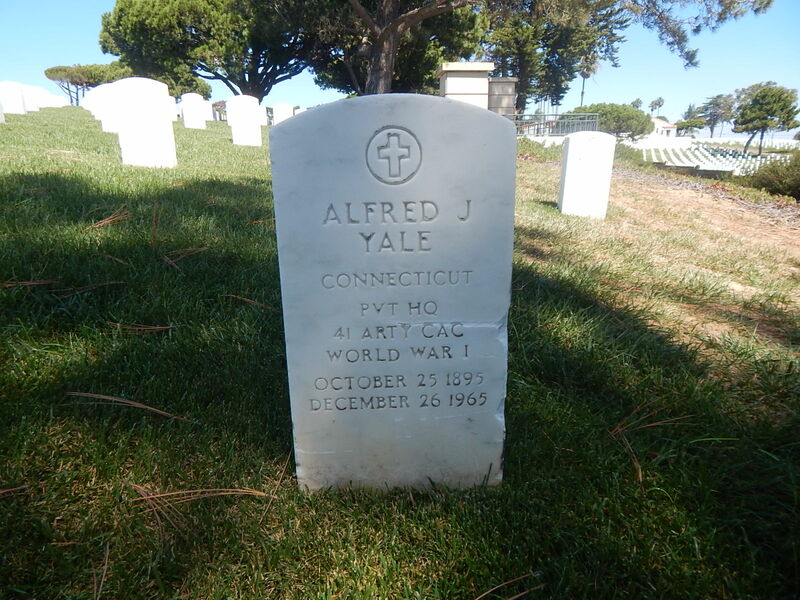 UPDATE 10/1/2015: I have had the opportunity to visit Alfred’s grave in the Fort Rosecrans National Cemetery in San Diego on September 18, 2015. Alfred is buried in the W section of the cemetery on the western side. Here is a photo of his tombstone. More information about my visit to him is in the posted dated 9/27/2015 Fort Rosecrans National Cemetery, San Diego, California on the Solomon Goss in Fearing Twp. in Ohio blog – see right side of this blog for link. 3. Annie Barclay Ford was born about 1876 in Connecticut and she married Henry A. Yale born 1859 in Connecticut. They had 6 children: Elmer, Frank, Rozelia, Annie, Ida, and infant. All these children were born the end of the 1800’s. Henry was also a son of Elmer and Lucy (Hart) Yale. Here is Henry and Anna’s marriage record. Henry A. Yale 32, Salesman, 1st marriage, Bristol, parents Elmer and Lucy (Hart) and Anna B. Ford, Bristol, 16 years old, at home, 1st marriage, born Collinsville, Ct., parents Jerome B. & Mary J (Bartlett). 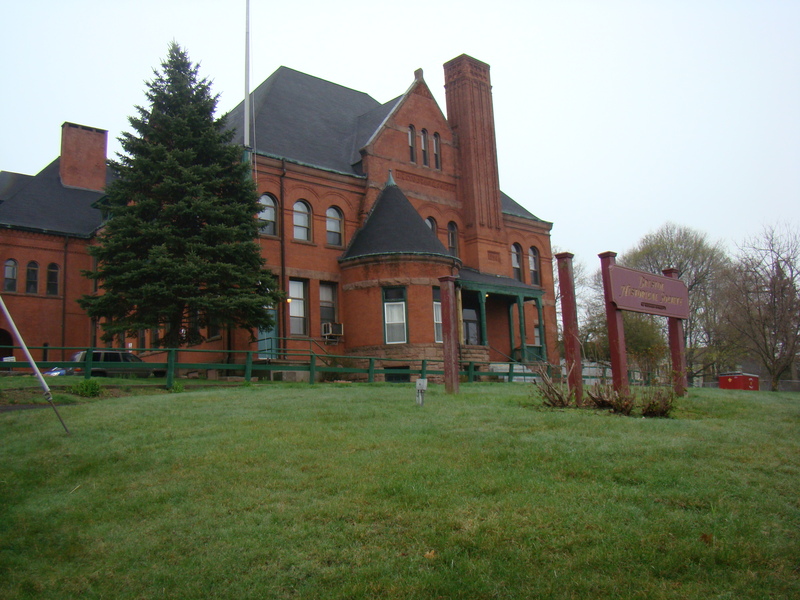 The license was obtained in Chicopee, Hampden Co., Massachusetts and registered by the town clerk John D. White. Source: Massachusetts Town and Vital Records, Intentions of Marriage and Marriages Solemnized, 22 November 1891, Bristol, Connecticut, Henry A. Yale and Anna B. Ford, page 183 Nov. 22, 1891. Line 27, 493 – Living with Ely, Adolph, 583 Ford, Jerome B., 24, M, W, Laborer all born Connecticut, 11, Janitor, Ford Mary 27 F, W, Keeping House, Ford Rosaliee, 3, F, W. Barclay, James, 21, M, W, Laborer. Source; Jerome Ford Family, 1870 U.S. Federal Census, Southington, Hartford Co., Connecticut, pg. 65, enumerated 29 June 1870, Deenis P. Farch. By 1880 Mary and Jerome moved to Bristol, Connecticut and remained there for the rest of their lives. 196/124 Ford, Jerome B. White, male, age 33, Machinist, born Conn., Father born Conn, Mother born in Mass. Mary J. Ford, age 36, Rozelie Ford age 12, Melissa Ford age 9 and Anna B. Ford 4 yrs. All 3 children at school. All born in Connecticut, parents and the children. Source: Jerome Ford Family, 1880 U.S. Federal Census, Bristol, Connecticut, pg. 11, SD #2, ED 25, 5 June, 1880. They are still in the same location in 1900 and we find Jerome and Mary with daughter Lizzie nearby. 11/12 Frank E. Yale, age 38, born Dec. 1861, white, married, 5 years, birthplace Connecticut, head, spouse is Lizzie M., white. Lizzie M. Yale wife, age 29 born Jan 1871, married 5 years, one child born one living. Alfred J. Yale age 8. Oct. 1896. All born in Connecticut. Occupation of Frank, farmer. 12/13 Ford, Jerome B., Head, male born Oct. 1846, married 34 years, born in Conn. both parents born in Conn. machinist. Mary J. wife, female, born Dec. 1844 age 66, married 34 years, 3 children born 2 living. born in Connecticut, Father in Scotland, Mother in Scotland, proprietor machine shop. Source: Frank Yale and Jerome B. Ford, 1900 U.S. Federal Census, Bristol, Hartford Co., Connecticut, SD#26, ED #120?, enumerated on 12-13th June, 1900 by E. Manchester. Annie, their daughter, moved to New York with her husband Henry A. Yale. 26/27 Yale, Henry A., Head, white, male, Jan. 1859, 41 years old, married 9 yrs., born Conn, both parents born in Conn. Peddler (vegetables) can read and write. Annie, wife, white, female, born July 1874, 25 years old, married 9 years, 6 children born, 6 living, born in Connecticut, both parents born in Conn. can read and write. and infant no name Yale age 2/12 March 1900. All children born in New York. Elmer and Frank at school. Source: Henry A. Yale Family, 1900 U.S. Federal Census, Brookhaven, Suffolk, New York, Sht#2, SD 2, ED 750, June 1 and 2, 1900. Jerome and Mary continued to reside in Bristol, Connecticut. They where there in 1910 and Frank and Melissa were still close. Line 40/48 – Ford, Jerome B. age 65, born about 1845 in Connecticut, Father was born in Connecticut, Mother born in Massachusetts. Spouse is Mary J. Married 45 years (1865), White, male. Mary J. Ford, age 66. Married, female, white. 3 Children born, 2 living. Born in Connecticut. Father born in New York, mother born in Scotland. He is a machinist in a machine shop. Line 38/46 Yale (Gale), Frank. E., head, age 48, born in Connecticut, father and mother both born in Connecticut. Spouses name is Melissa M., Married, male. Melissa M. Yale age 39, Alfred J. Yale age 14. Married 15 years (1895). Melissa has one child born one living. Melissa was born in Connecticut and both parents were also born in Connecticut. Occupation (can’t read). Source: Jerome Ford and Frank Yale Families, 1910 U.S. Federal census, Bristol, Connecticut, sht# 3B. SD No. 27, ED 132, April 3, 1910. Meanwhile Anna, the sister, continued to live in New York and appears in the 1910 census there. Yale, Henry, son, 8, S.Yale, Frances, son, 5, S.Yale, William, son, 3/12, S.
Source: Henry Yale Family, 1910 U.S. Federal Census, Patchoque, Brookhaven, New York. SD#132, ED#1355 (many edits to districts), Sht#26, enumerated on 17 May, 1910, [S.C. Callius]. So what happened to Melissa, well after Frank’s death in 1915, She remarried to an Alvah L. Tilton. They were together in the 1920 census. Line 16, 248, 349, Tilton, Alvah L., Head, 0, M, M, W, 35, M, yes yes, born Vermont, father Vermont, mother New Hampshire, [forger], Ball bearing shop, W, 138. Tilton, Melisa M, wife, F, W, 48, M, yes, yes, born Connecticut, both parents born in Connecticut. Source: Alvah Tilton Family, 1920 U.S. Federal Census, Forestville Village Bristol City , Hartford Co., Connecticut, SD# 1 Concession, ED# 12, Ward 2, Sht# 19, enumerated on 17 and 19th of January, 1920, by Erwin R. Rowe. Melisa was in the 1930 U.S. Federal Census for Bristol, Connecticut. She was widowed and living alone. She had $10,000. [Dehiss Road] Line 11, 348, 357, Yale, Alfred J., Head,), $45,000, yes, M, W, 37, M, 22, no, yes, Connecticut, parents born in Connecticut, yes, Lumber piler, Lumber Company. Yale, Bertha H., wife of H, F, w, 35, M, 20, no, yes, born Ohio, father born Indiana, mother Ohio, yes, Farmer, general farm. Hofflund, Mary E, stepdaughter, F, W, 15, S, yes, yes, California. Hoffland, Phyllis B., step-daughter, F 2, 15 S, yes, yes, California. Hoffland, Charles A., step-son, M, W, 12, S, yes, yes, California. The father was born in Illinois and mother in Ohio. Source: Alfred Yale Family, 1930 U.S. Federal Census, El Cajon Twp., San Diego County, California, ED#37-2, SD#21, Enumerated April 17, 1930 by Everett J. Mills. We find that Melisa headed to California and was living with Alfred and his wife in the 1940 U.S. Federal Census in San Diego, California. She died in 1947. Line 34, 82, 0, 3000, n10 Yale, Alfred, head, M, W, 44, M, No. C-2, Connecticut, Same house, yes, 40, Lumber Piler, Retail lumber, PW 988, 73, 1, 48, 0 yes, 68 farm schedule. Tilton, Melissa, Mother, F, W, 69, Wd, No, H03, Connecticut, R, Hartford, Connecticut, No, No, No, No, No, U. Source: Alfred Yale Family, 1940 U.S. Federal Census, El Cajon, San Diego Co., California, SD#20, ED 37-15, Sht#4A, Enumerated on 4/8/1940 by Edward A. Bodie. At this time I do not know what happened to Annie nor do I have the death dates and burial location for Henry and Annie Ford Yale. She was a widow in 1917 during her mother’s probate. I cannot find her in the census and am having trouble even find her children. Charles E. Yale, age 25, Address: Bay Av. Patchoque, NY, date of birth Feb. 25, 1893, natural born, born Bellport, NY, driver, C.St. Vroonamn?, Patchoque, NY,no dependents, Single, Caucasian, short, medium, eyes gray, dark brown hair. signed by R.A. Newton, Precint 19, Suffolk Co., NY. Source: Charles E. Yale, #64, WWI Draft Cards – Registration Card, #2547, Suffolk County, New York #31-5-9-A two pages. In the next post I will share about the deaths of Mary J. Barclay Ford and Jerome Ford her husband. NOTE: If you do research in Connecticut join a genealogical society or you will have trouble in some courthouses and not allowed to see the records without this membership. I had no problems till I went to the courthouse in Bristol. So just be aware that their laws are strict regarding vital records. It may not be the record that is the problem it is the index for some are beyond the privacy rules.